Singer/performer Lila Angelique in Central Park, NYC. I think this image might give me nightmares if I dwelt on it, which is why I'm nominating it. Exquisite! Mysterious and ethereal, yet very real and emotional. You can feel the moment and a connection between the subject, photographer, and viewer. Everything sparkles -- even the varied tonalities in her hair. 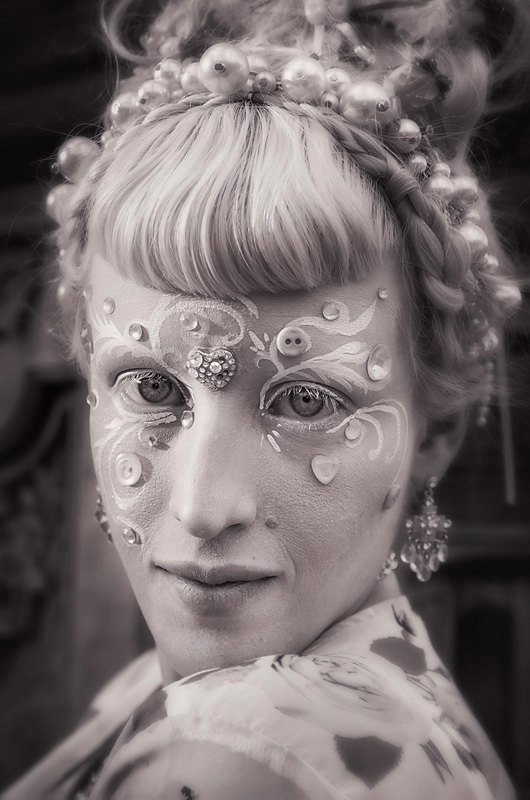 Truly exceptional is that her gaze pierces through the lyrical filigree details around them, further enhanced by the use of black and white as well as the blur of the background. Although more bejeweled, the image is reminiscent of Vermeer's "Girl with a Pearl Earring" and also evokes Shakespeare's Fairy queen in a Midsummer Night's Dream. Gentle, touching, and a powerful portrait in natural light -- BRAVO! Nominated!! !